Prehistoric Beast of the Week: Happy 100th Anniversary to 5027! I'm biased. I'm not afraid to admit it, especially when it comes to my home. I grew up in New Jersey and traveled New York City frequently for my entire life. 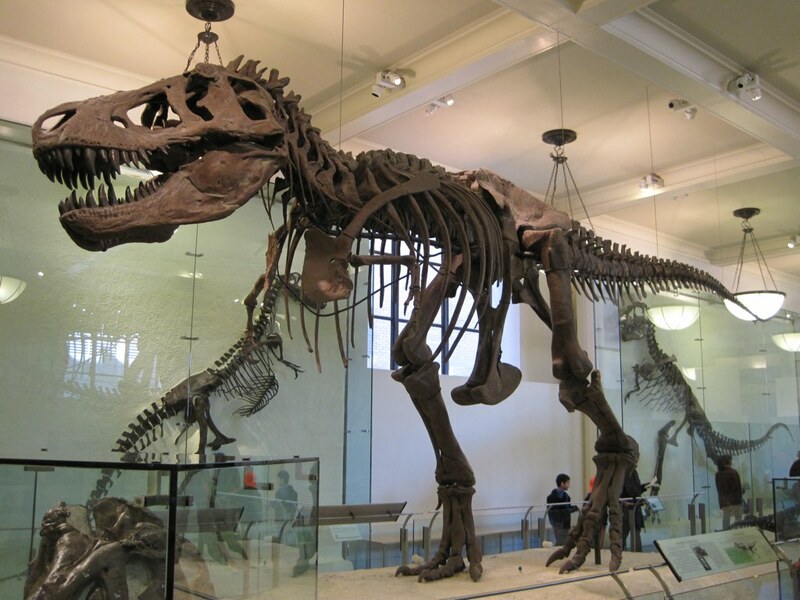 One tradition when I was tiny was to visit the American Museum of Natural History with my family every Mother's Day. My mother enjoyed looking at the exhibits about human cultures from around the world but naturally all that mattered to me was seeing the dinosaur hall on the fourth floor. (The dioramas of modern animals were pretty cool too...and the hall of ocean life.) This is not uncommon and since working there this summer I have witnessed many children with the same mindset. For example, the following is an actual line I overheard a little boy (I estimate about five years old) say as his mom walked him in through the museum's main entrance one day. "If I don't see the dinosaurs right now I am going to punch every person here in the face." Although I am firmly against violence, I can't help but respect that little guy just a little. When it was to be first mounted in the museum, it was done so in an upright position with its tail dragging on the ground. This made sense at the time since scientists hadn't really started connecting larger dinosaurs to birds yet and based most of their reconstructions on lizards and crocodilians. 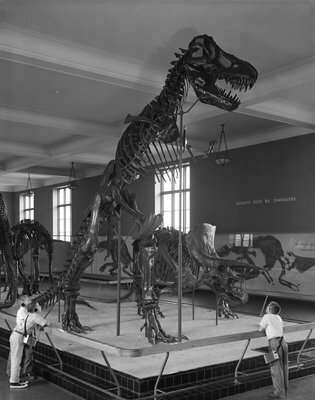 The mount itself is actually a combination of two specimens of Tyrannosaurus that were discovered around the same time in the early 1900s, AMNH 5027, which makes up the majority of the skeleton, and AMNH 973, which was discovered first but is less complete. The rest of the skeleton that they still didn't have anything of they used the more completely known Allosaurus for a reference, which is why it originally had three fingers on each hand, instead of two. AMNH 5027's original pose at the museum. That Triceratops next to it is also there today, but hasn't changed at all and is thus, really outdated in a few catagories. This photo is available to see along with many others at the AMNH research library. Flash forward to the 1994 which is when AMNH 5027 received a makeover and was reposed in a more horizontal position to go along with updated information about how dinosaurs carried themselves with their tails above the ground for balance. Along with it, the Apatosaurus/Brontosaurus mount in the same hall was reposed in the same way, and the mind-blowingly dynamic Barosaurus vs. Allosaurus display was debuted in the museum's main entrance. This is the exhibit I have known since I was little, since before that they were either renovating it (so it was closed to the public) and before that I was too young to remember/wasn't born yet. One vivid memory I remember when I was extremely young was seeing the Allosaurus mount intended for the entrance hall being wheeled into a back room as I passed by a hallway intended for employees only. It has stayed with me to this day. If you visit AMNH 5027 now, this is what you will meet. So why talk about all this now? Well, like I stated earlier, December 2015 marks AMNH 5027's one hundredth anniversary of being on display at the American Museum of Natural History. 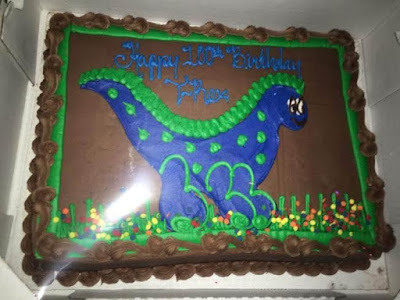 I consider myself SO LUCKY to have started working there the same year and thus, was able to be present for the museum's paleontology department's birthday party for it! 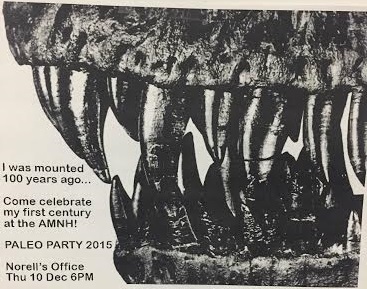 Every department at the museum actually has it's own holiday party in December, but paleontology's sort of doubles as an anniversary since the T. rex was erected in December anyway. Convenient! The baker we used obviously doesn't know the proper way to write T. rex...or what a T. rex looked like... It tasted good. Photo courtesy of Rosa Luna who is the digital marketing manager at the museum. Below are a few more pictures that were taken from that night. It was so much fun and was a great opportunity to meet and get to know better, other people with the same passion as myself. Follow the toothy fliers to get to the party! Dustin Growick, host of The Dinosaur Show, and I...did not plan this. We both have the same sense of paleofashion is all. 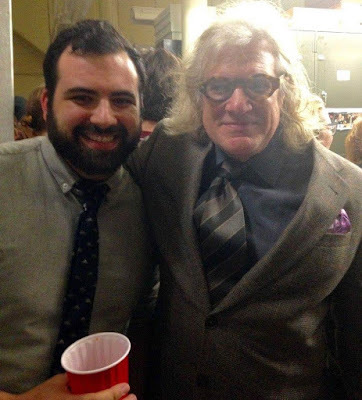 It was awesome to meet Dr. Mark Norell, a paleontologist I had seen on television since childhood. It was even more awesome to hear about Dr. Norell's exciting most recent dinosaur project! Dingus, Lowell. The Halls of Dinosaurs: A Guide to Saurischians and Ornithischians. New York: American Museum of Natural History, 1995. Print.